Pain on the inside of the knee is known as medial knee pain and is most commonly caused by caused by a sudden trauma (acute knee injury). Medial knee pain may also develop gradually (chronic knee injuries) over time, through overuse or poor lower limb biomechanics. If you are not sure what your injury is, then why not try our symptom checker? 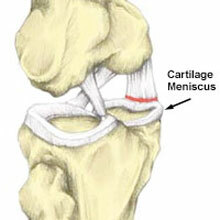 A torn meniscus is a tear of the semi-circular cartilage in the knee joint causing pain on the inside of the knee. It is commonly injured through direct impact in contact sports or twisting, but can also occur in older athletes through gradual degeneration. Treatment depends on how bad the injury is and may require surgery. Symptoms include pain on the inside of the knee which may be of sudden onset but can also occur gradually. The patient will usually experience pain when fully bending the knee or squatting down. There may be swelling present but not always and the patient may also complain of the knee locking or giving way. 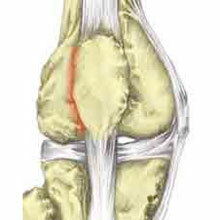 There will be tenderness along the joint line on the inside of the knee and range of motion is likely to be restricted. A doctor or sports injury professional can confirm the diagnosis with the aid of specific assessment tests including McMurray’s test and Apley’s test and may refer to an MRI scan. Read more on Medial meniscus injury. Patellofemoral Pain Syndrome (PFPS) is a generic term used to describe patella pain, at the front of the knee around the patella (kneecap). Symptoms include an aching pain in the knee joint, particularly at the front of the knee around and under the patella. There is often tenderness along the inside border of the kneecap and swelling will sometimes occur after exercise. Patellofemoral pain is often worse when walking up and down hills or sitting for long periods of time. Other signs a sports medical practitioner may pick up include a click or cracking sound when bending the knee, wasting of the quadriceps muscles if the injury is an old one and tight muscles around the knee joint. Read more on Patellofemoral pain syndrome. 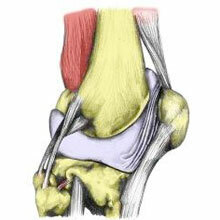 The synovial plica is a synovial fold found along the inside of the kneecap causing medial knee pain and discomfort. It is sometimes be confused or misdiagnosed as patellofemoral pain syndrome as the symptoms can be similar. Symptoms of a synovial plica include a sharp pain at the front inside edge of the kneecap. 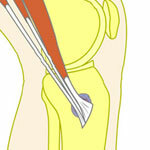 The pain may also be towards the back of the patella. The athlete may feel a sharp pain when squatting. A synovial plica may sometimes feel like a thickened band under the inside of the kneecap. This is one of the less common causes of pain on the inside of the knee. The pes anserine is the point on the inside of the knee where the tendons of the semitendinosus muscle (one of the hamstrings), Sartorius (the strap-like muscle which crosses the front of the thigh) and gracilis (adductor) muscle combine and insert. The bursa which lies under the tendon to help lubricate movement can become inflamed through overuse. The tendon may also become inflamed, or more likely degenerate if the injury is chronic. Pes Anserine Tendonitis is often difficult to distinguish from a medial ligament injury because the symptoms are similar and both are likely to be painful when stressing the inside of the knee joint. Treatment is to treat the symptoms through rest and cold therapy, as well as identify possible causes. Ice can be applied for 10 minutes every hour initially for the first 24 to 48 hours reducing to 3 or 4 times a day as required. A doctor may prescribe anti-inflammatory medication such as ibuprofen which may help reduce pain and inflammation. Stretching the surrounding muscles such as the quadriceps, hamstrings and adductor muscles may help. Read more on Pes anserine bursitis/tendinopathy. Osteoarthritis is a common cause of knee pain and usually affects people over fifty years old. It occurs when cartilage which protects the bones degenerates. Pain develops gradually over time and often causes stiffness and sometimes swelling. 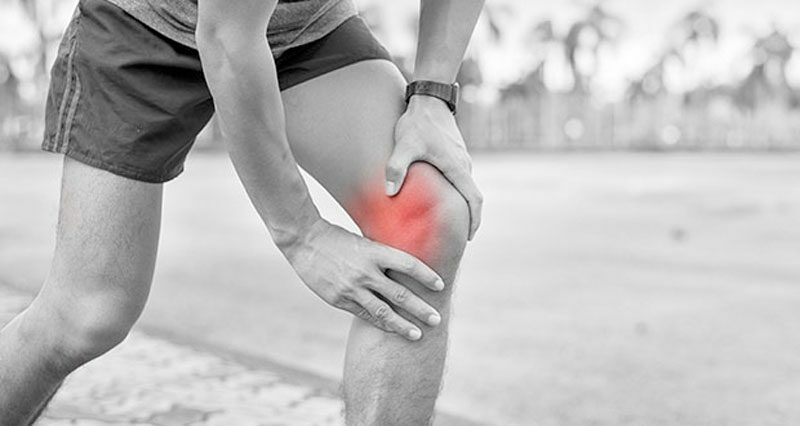 Osteoarthritis knee pain may start as a deep aching pain in the inner knee that is worse after exercise. Stiffness in the joint is common, particularly in the morning, however, this may reduce with movement as the joint produces lubricating synovial fluid. Sometimes a clicking or cracking noises are heard when moving the knee. As yet there is no cure for arthritis. However, a number of treatments may slow the progression of the disease. Some specialist knee supports or braces have been proven to provide pain relief in some cases of medial compartment osteoarthritis, by reducing the load on that compartment. NSAID’s- Non-Steroidal Anti-Inflammatory Drugs such as ibuprofen can provide some temporary pain relief. Weight loss can help as obesity is associated with the onset of osteoarthritis and can have a significant effect on slowing the disease progression. Read more on Osteoarthritis of the knee. Pain on the inside of the knee can result from injuries or conditions elsewhere, especially, in the hip and lower back. The sciatic nerve gets pinched or compressed radiating pain down the leg. Other causes of medial knee pain include Tumors in young athletes, Slipped capital femoral epiphysis, Perthes’ disease and referred pain from the hip.